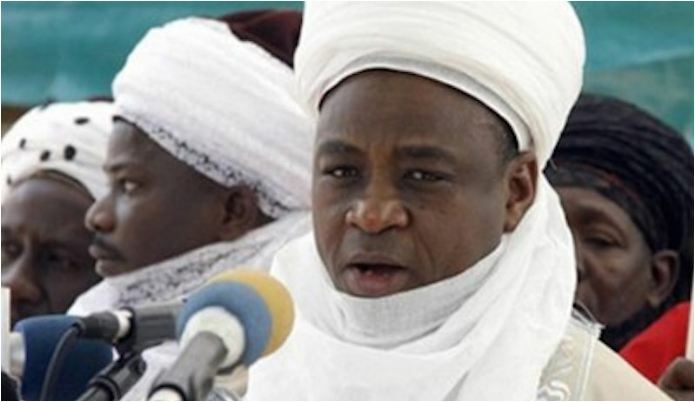 The Sultan of Sokoto, Alhaji Muhammadu Sa’ad Abubakar III, has cautioned Christian leaders in the country against making unguarded utterances that could make terrorists win their war against the Nigerian state. Speaking while addressing resident communities, heads of security agencies, religious leaders and journalists during a Ramadan breakfast dinner in his palace in Sokoto, Monday night, the monarch cautioned Christian leaders against making utterances capable of plunging the country into religious war. He described such utterances as very unfair, insisting that terrorism has no religion or ethnicity. The Sultan wondered how Muslims would connive with the Boko Haram insurgents to abduct school girls. “Did the Muslims connive with Boko Haram to abduct the girls and release others? No. For them to now make that comment that if she dies in the hands of Boko Haram there will be a religious war is very unfair. “How could you start attacking Muslims because this innocent girl happened to be a victim of murderous terrorists? It means the insurgents are winning the war because that is what they want. “If they hear about this and went and kill the innocent girl, that means you are part and parcel of what make them to do that because they want to cause confusion in the country. We are all praying for her safe return and for the safety of every Nigerian irrespective of his or her religion,” he said. The monarch noted that more Muslims were killed by Boko Haram than Christians which even the former President Goodluck Jonathan had acknowledged in the past. The Sultan urged the media to save this country from impending violence and imminent collapse. According to him, some of the media reports were inimical to the nation’s peace and unity. He expressed dismay that some media outlets including the social media post unverified reports and gory pictures to create tension in the country. The monarch cited one picture of Fulani herdsmen holding G4 riffle used by some media organisations to portray attacks on innocent Nigerians as uncalled for because the picture, according to him, was that of herders in the Central African Republic which had been in existence for over 20 years. “There is no G4 riffle because it had been wiped away for long. That picture being used particularly by the Channels TV was that of herders in the Central African Republic, who were being terrorised by rustlers because cattle rustling started in their country long before coming to Nigeria,” he said. The monarch to this end, threatened to denounce his fellowship of the Nigeria Union of Journalists (NUJ) in protest against misleading and unverified stories aired or published by their members. He however stressed that the clashes between herdsmen and farmers were purely economic but being hijacked by some criminal elements. The monarch said those killing innocent people, especially in the Middle Belt were criminals who should be arrested and punished. “You don’t arrest or kill innocent Fulani men just like what had happened in Benue State when innocent Fulanis who were on transit were stopped and killed by some residents of the state,” he cautioned. He expressed worry that the killings could continue because some politicians would want to use it to have an edge over their political opponents. The Sultan called on Nigerians to be vigilant and endeavour to expose criminals in their midst, even if they are their fathers and brothers. “We should all see ourselves as security personnel. Let us not leave them alone. Don’t hide criminals even if they are your fathers and brothers. Because too much blood had been shed and this is why God is angry with us. “I believe there are more good people than the bad ones. Let the good ones come together and defeat the bad ones. We have done that while fighting malaria and we can do it again,” he said. He stressed the need for more effective tools and welfare for security agents, saying they are working round the clock to restore peace in the country.